Well here I sit at my typewriter not knowing how to start. My subject is biceps development. 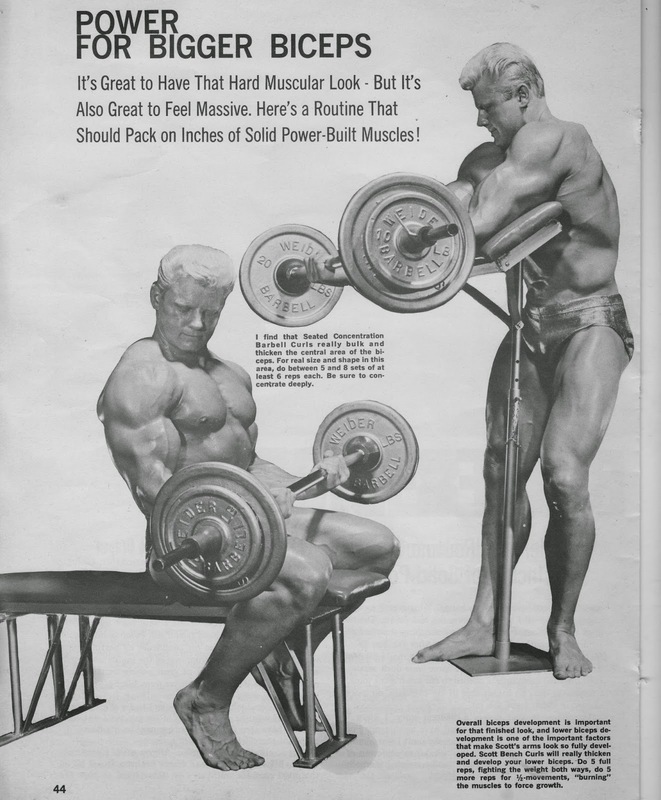 I'll bet more words have been written about the arms - and the biceps in particular than any other topic in bodybuilding. As a result I am sitting here filled with stories that might interest you but can't decide which one will illustrate my point the best. Living here around the Muscle Beach area near the Weider West Coast office, I'm fortunate enough to be near the very best in bodybuilding. I'll never forget when I first got here from New Jersey. I was almost too embarrassed to go down to the beach. I'd heard all about the great men who trained there and didn't feel in the mood to be compared. To me, I was just big and fat. A great white whale. 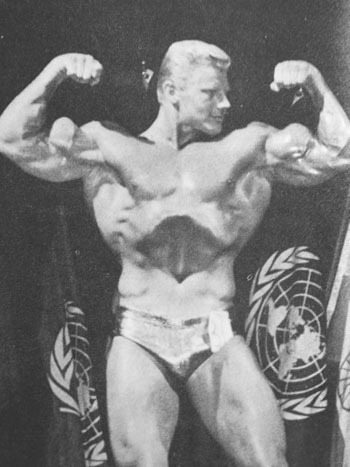 Luckily, Joe Weider felt that I had a great potential so he stuck with me and boosted me every chance he got. While I was grateful, it also worried me. Could I ever live up to the buildup I was being given? I felt I had to prove I could, so I knocked myself out in my training sessions. The hard work started to pay off as my bodyweight began to drop and the cords of definition began to crease my skin. During this process very few saw what I looked like. I would train in a heavy shirt. Like the ugly duckling, I was almost afraid to come out for others to see. Big fat Dave. This preyed on my mind. I spent many a sleepless night thinking about that 'Big Fat Dave'. Maybe they were right, maybe I was big and fat and could never change. Whenever I looked into a mirror, all I could see were the bad points. This is good to an extent, but I never saw anything that looked good, which can be pretty depressing. After the first year, I passed on competing in the IFBB Mr. America contest. I gave some lame duck excuse. I felt I needed more time. I needed to cut down some more. I needed to diet, do higher reps, do more situps, in short, I still felt fat. The following year it was a different story. I knew I would have to put up or shut up. 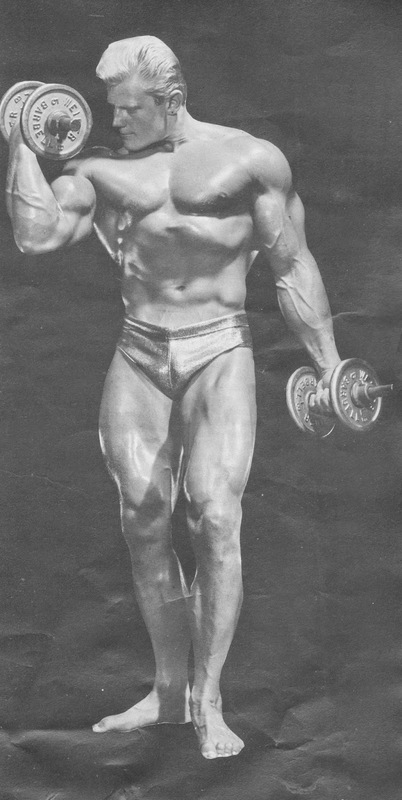 For two years Joe Weider had built up my public image and plugged me to the sky until I was almost a myth. Now it was time for the 'whale' to come out of hiding and show the world what I could do. One night, a few weeks before I went to the Mr. America contest, I visited my good friend Bill Pearl at his gym. I suppose I wanted to boost my confidence by hearing some words of encouragement from of the immortals in our sport. He loaned me a pair of great posing trunks which made me feel a lot better. While we were talking, I couldn't help but notice the food Bill was consuming. It was dinner time and he couldn't leave the gym so I had a chance to see for myself what he was stocking in his gut. As I watched, he must have seen the look of amazement on my face. "Want some?" he asked with a smile. "Err . . . no thanks," I replied. After a pause I ventured, "Look, Bill, I know it's none of my business, but is all of that food good for you?" "Sure it is," he replied quickly, "And it tastes good, too." I could readily believe the latter. "I know," he interrupted, "won't I put on weight?" Bill just nodded. "But that's good for you. You train down and starve for months before a show. After it's over, I feel you should rest the body a little and let it stock up on some size. It's not good o keep in razor sharp condition all the time." "It's not good to keep in condition?" I asked. "Not in the type that a bodybuilder feels is good. You've got to remember that we train for appearance as well as actual health. Sure they go hand in hand. Some men, however, have to go on special programs to keep looking razor sharp. After a while, after months of special diets and special routines and special everything, you're due for a rest or you'll get pretty stale. In other words, you can't keep pushing and not expect something to give." Those words from Bill Pearl stuck in my mind. It made good sense. Someday I would have to try it. 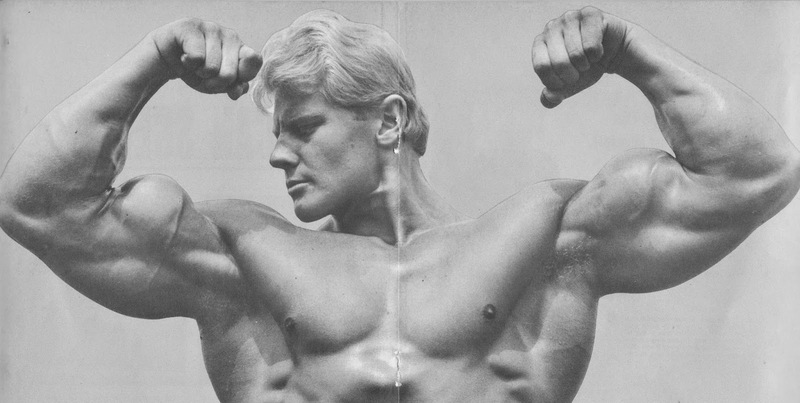 At that moment I was too busy trimming down for the 1965 IFBB Mr. America contest. At that show I came out as the 'new Dave Draper'. I surprised a lot of people and won the title. Now I didn't want to lose what I had worked so hard to get. I never wanted to be heavy again. Another year went by as I trained for the IFBB Mr. Universe title. I won the 1966 contest, but this time I came back to Muscle Beach feeling a little tired. For years I had done just what Bill Pearl had said. I had kept myself in razor sharp condition and it was beginning to tell. So, last September, right after I won the Mr. Universe title, I decided to let up a little. Not a layoff but a 'cutoff' of a few exercises, sets and reps. Training 'normally' for a while would be rest period enough, which might not keep me in razor sharp condition, but would nevertheless help keep me in good shape and help me gain additional size. I ate freely, but not foolishly. In other words, I began eating more natural carbohydrates, like certain fresh fruits and vegetables and their juices, than I had ever permitted myself to while training intensively for definition. Nonetheless, I did not eliminate a high concentration of proteins from my diet. In contrast to my contest training, I also allowed a small amount of fats to enter my diet, in the form of an occasional glass of milk, but mostly of the unsaturated variety as found in vegetable oils. In other words, my meals were now more balanced - not so heavy on proteins and not so light on other essentials of well-being, and this gave me more energy. I thought to myself, "Now that my overall routine has been lightened and now that I'm powered with a reservoir of energy as a result of my present diet, maybe I should concentrate on my biceps a little harder than usual . . . maybe I can train them into even greater size." It made sense. I wouldn't eliminate other exercises, not even those for my triceps and forearms, but now that the rest of me wasn't working as hard, this was my chance to focus on my biceps and blast them alone into bigger size. My biceps routine would compromise just three exercises: the seated barbell concentration curl, Scott bench barbell curls, and alternating dumbbell concentration curls, standing. 1) Seated Barbell Concentration Curl: The motion is similar to that of an ordinary standing barbell curl, except that it's more difficult; there's less sway to and fro, less cheating, which means more stress on the biceps. Use enough weight so that your biceps really have to work. Perform between 5 to 8 sets or never less than 6 reps. When you go to the lower range of reps make sure you do the higher range of sets. Less reps, more sets. More reps, less sets. Remember that this routine is not to prove your endurance, so get enough rest between sets to use heavy weights. Each week try to exceed the previous week's best in either reps or weight. The motion is simple, you strict curl from the thighs to the chin, lower the weight slowly, and be sure to force out the last rep of every set. Do this one first. 2) High Concentration Alternate Dumbbell Curl, Standing: Performed like ordinary alternate dumbbell curls, except use a slower motion and really concentrate on the biceps being worked. Do 5 sets of 6 reps. Maintain good form and fight the weight both up and down. 3) Scott Bench Barbell Curls: An EZ-Curl bar permits a more natural positioning of the wrists for this exercise so that you can concentrate more fully on the movement. Try alternating sessions with a straight bar. Use a moderately heavy weight, and employ moderate speed. Do 5 complete reps, fighting the weight both ways. After 5 reps of the complete movement curl the weight halfway (for burns) for 5 or so more reps without stopping. Do 5 sets.